Teretonga was busy to start the 2010 Yunca Tour on Friday October 1st with bike rather than motor racing. Some of New Zealand and Australia’s best young cyclists fought it out in the first stage of the Yunca Junior Tour of Southland. One hundred and sixty four cyclists completed an individual time trial to determine who starts tomorrow in the yellow jersey across four age-group divisions. The under 19 men’s division was prologue was won by Cycling Southland’s Dillon Bennett who pulled off an impressive win over hot favourite Josh Atkins. Bennett who rides in the H&J’s Outdoor World team said “I really wanted to win the yellow jersey – that’s what I had been thinking about when I was out training in the snow a week or so ago and I guess that must have paid off”. Bennett went on to say that he was going to keep a close watch on any breaks tomorrow to try to protect the yellow. Forty three cyclists started in the under 17 men’s division which was won by Dillon Kennett from Waimate by 5 seconds. Kennet is a recent winner of the Timaru and Taieri Tours in this division. Next best was Western Australian rider Bradley Linfield. The under 19 and 17 women’s prologue events were held in conjunction. an under 17 rider from Western Australia took out the honours, Elissa Wundersitz who recently won silver in the individual time trial at the Australian Nationals bet out under 19 rider Georgina Williams from North Harbour. Wundersitz win was a classy effort as Williams is in good form and was expected to be hard to bet. Georgina Wilson under 17 was third and Laura Gretton under 19 came in 3 seconds later to pick up fourth. Southland’s talented under 15 rider Mike Culling hit form to take out the under 15 boys category from Jack Edwards of NSW who recently won bronze in the individual time trial at the Australian Champs. A Southland newcomer Laura Heywood narrowly bet Maxyma Cottam from New Plymouth in under 15 girls, with Georgia Vessey from Wakatipu a very close third. Southlanders took out all three placings in the under 13 boys division with Josh Carpenter sneaking in ahead of Hayden Strong and Hamish Beadle. Tahlay Christie from Western Australia bet Otago’s Caitlin Kelly to win the under 13 girls division. The weather behaved and rain appeared as the last rider crossed the line, a somewhat unique experience for many at the Yunca Tour. Stage 2 of the Yunca Tour started in sunshine at Otautau on Saturday morning. The Under 19 men raced over 7 kilometres around the rolling hills of Otautau and Thornbury. The stage was taken out by Benchmark Team rider Alex Frame. Southland’s Dillon Bennett retained the yellow with Scott Creighton fro Te Awamutu taking the KOM jersey and Alex Frame taking the sprint jersey. The U19 & U17 women’s races are run together during this Tour and talented U17 Alexandra rider Sophie Williamson took out the stage win. Elizza Wundersitz from Western Australia did enough to hold the U17 yellow jersey and Georgina Williams from Auckland held the U19 women’s yellow. Kirsty Mills U19 won the Queen of the Mountain and Sophie Williamson U17 won the sprint jersey. The U15 boys race was a tight finish with Travis Smedley from NSW winning the stage and the sprint ace. The yellow jersey was won by Bradley Heffernan from NSW and the King of the Mountain was won by Ollie Jones from the PNP Club in Upper Hutt. Another Alexandra female rider, Georgia Vessey, won the U15 women’s race which was good enough to also win the yellow jersey. Maxyma Cottom from New Plymouth hold the QOM and Madison Farrant from Hamilton took out the sprint ace jersey. The U13 boys and girls raced over 14 kilometres. It was a Southland trifecta in the boys race with Josh Carpenter holding the yellow and galloping ahead of Hayden Strong and Hamish Beadle who also holds the sprint ace jersey. Tahlay Christie of Western Australia retained the yellow and won the stage from Phoebe McCaughan and Lakein Cottom. Stage 3 was raced over the hills of Tuatapere and Clifden. The U13 boys and girls standings remained the same as the previous stage. The U15 girls saw Georgia Vessey come in third but keep the yellow and QOM jerseys. Madison Farrant won the stage and retained the sprint ace jersey. The U15 boys was won by Connor Stead from the Pegasus Club in Christchurch. Stead bet Regan Gough from CHB Club and Jack Edwards from NSW in a tightly fought race. Stead stepped into Yellow, Travis Smedley won the Sprint Ace and Bradley Heffernan won the KOM. Dillon Kennett lost the U17 men’s yellow but won the sprint ace jersey. Hayden McCormack won the stage and was second in GC behind Bradley Linfield from Perth who raced intelligently to take the yellow. Another Australian rider from NSW, Ben Fox won the KOM jersey. The U19 men raced over 80 kilometres. Fraser Gough rode a strong race to win the stage and take the yellow jersey. Scott Creighton kept the KOM and the sprint ace jerseys. 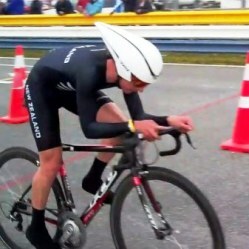 Sunday’s racing started with a criterium race around the inner city of Invercargill in showery slippery conditions. Alex Frame won the stage and the sprint ace jersey. Fraser Gough did enough to keep the yellow and Scott Creighton kept the KOM. The Under 19 and 17 women’s criterium saw Sophie Williamson judged the timing for the sprint and finish perfectly to dominate the race. Williamson won the category QOM and sprint ace jerseys; but Georgina Wilson did enough to retain the yellow U17 jersey and Georgina Williams the U19 yellow. The U17 men category has significant numbers in the field which promised to be interesting in the slippery conditions and tight corners. The Stage was won by Hamish Scheurs from Hayden McCormack. The Yellow was retained by Bradley Linfield, the Sprint ace was won by Dillon Kennet and the KOM by the NSW rider Ben Fox. The U15 men’s category stage win, sprint ace and yellow was won by Jack Edwards of NSW, fellow NSW rider Bradley Heffernan took the KOM. In the women’s category Holly Edmonston of Waimate won the stage but Georgia Vessey did enough to retain the yellow and the KOM jerseys. Madison Farrant kept the sprint ace. The U13 boys and girls stage and jerseys winners remained the same as the previous stages. The final stage, stage five was raced around the Rakahauka – Springhills circuit. The showers stayed away but the wind proved to be testing for many. The U13 standings remained the same with Southland’s Joshua Carpenter winning the U13 boys yellow jersey and the stage. Carpenter had a mechanical issue in the race but was strong enough to catch up and continue on to win the stage. 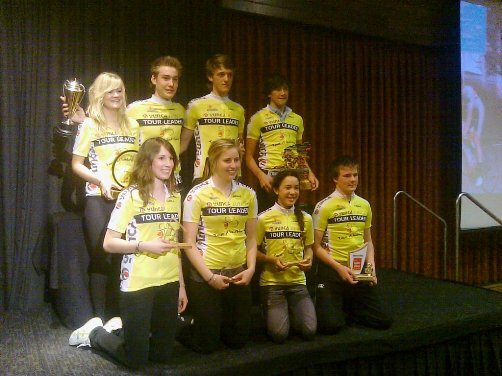 Tahlay Christie of the Midland Club in Western Australia went home a happy girl with a well deserved yellow jersey. The Under 15 girl’s stage was won by Wakatipu’s Georgia Vessey who also won the yellow and the Queen of the Mountain categories. Madison Farrant from Hamilton won the Sprint Ace category. The Under 15 boys stage was won by talented Sydney rider Jack Edwards who won the category yellow and sprint ace jerseys. Bradley Heffernan also from NSW retained the King of the Mountain jersey. The U17 men’s race was fascinating with many no one ride really dominating the classy field. Dillon Kennett from South Canterbury won the stage in windy conditions from Theo Yates of the South West Jets Development Squad in Western Australia. Kennett also won the categories sprint ace jersey and fellow Australian Ben Fox won the King of the Mountain category. Hayden McCormack from Te Awamutu, the 2010 New Zealand National road and time trial champion won the general classification overall and took the Yunca U17 men’s yellow. The U19 and 17 women’s stage was won by Alexandra’s Sophie Williamson. Williamson an U17 rider won most stages and the Sprint ace and Queen of the Mountain jerseys for the U19&17 division but did not win the yellow. Georgina Wilson of Mt Eden Auckland had a blinder time trial and did enough during the tour to keep the U17 yellow jersey. U19 rider Georgina Wilson retained the yellow jersey for this category throughout the tour. The U19 men final stage went down the wire with an all out sprint after 80 kilometers by Christchurch rider Alex Frame from Southland’s Brehan Cairns. Frame convincingly won the sprint ace jersey with 22 points, 10 points clear from the next rider Fraser Gough. Joel McMillan from the Taman Wheelers Club in Nelson won the King of the Mountain jersey with 12 points, 2 points clear of Scott Creighton. Fraser Gough of Havelock North was in the spritn for the finish and retained the yellow jersey for the category by 31 seconds over Scott Creighton who was second on general classification. Otago’s Brad Evans was third. The Tour is followed by a Track Carnival in the ILT Velodrome on the nights of Tuesday 5th and Wednesday 6th October. For more on the Yunca Tour click here.